The Skype WiFi application offers those on the go an alternative to pricey international data plans, which can fetch around $25 for just 20MB worth of downloads, by allowing them to connect to locally available WiFi hotspots for as little as 6 cents per minute. Skype says it is working with a third party WiFi operators to provide access to over 1 million WiFi hotspots around the world, including hotels, airports, train stations, convention centers, bars and restaurants, thus eliminating extra data roaming costs or other WiFi voucher purchases. The application itself —previously known as Skype Access —is available as a free download from the App Store, but requires that users purchase Skype Credits in order to connect to one of the supported hotspots. 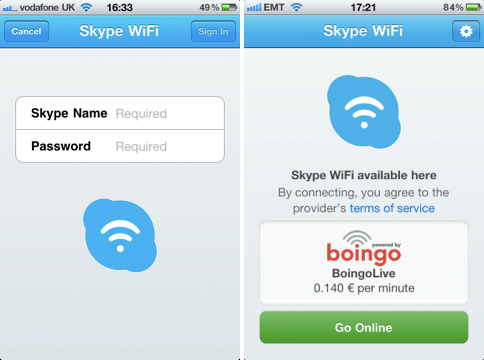 Prices for access to Skype WiFi hotspots start at US$ 0.06/4p/0,05 (inclusive of VAT) and there is no data cap in place, which means iPhone, iPod and iPod touch users can use the same hotspot connection without worrying about any traffic limitations. In order to celebrate the new Skype WiFi app" and give users a chance to take it for a test spin, Skype said it plans to offer up to 60 minutes (or four 15-minute sessions) of free internet access for each unique Skype ID starting Saturday, August 20, 00:00 BST until Sunday, August 21, 23:59BST. A leading provider of VoIP and instant messaging services, Skype also offers other iOS applications specifically designed for Apple's iOS devices that offer free voice calling and free video calling over WiFi, as well as chatting capabilities. Those apps are direct competitors of native iOS applications, such as FaceTime and iMessage, the latter of which is an SMS-style WiFi messenger Apple plans to release as part of iOS 5.0 later this fall.